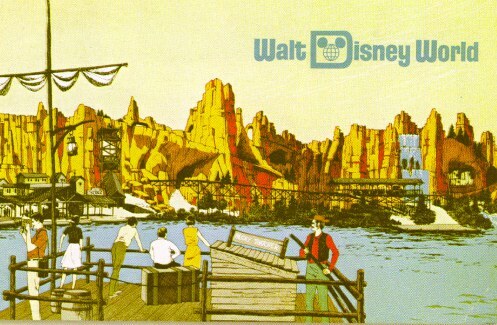 2017 Walt Dated World April Fool's Day Prank | Bob-A-Round Boats and Other Early Water Activities | (Lake) Buena Vista (Golf) Club | Mouseketeer Alison's Clubhouse | Walt Deleted World: Ideas That Were Never Built | Walt Disney World Conference Center | What's (No Longer) Cooking at Walt Disney World? Through the years, many ideas have been planned for the Disney theme parks but never built. Sometimes the budget was too high or the proper technology didn't exist to build what the Imagineers envisioned. Visit each park below to see what could've been at Walt Disney World. This is just a small sample; for more in-depth discussions of unrealized concepts, visit any Disney fan website or blog. Please note that in order to show as much detail as possible on the following concept paintings, the pictures may take longer than normal to load.